Written with U.S. Senator and 2000 Democratic Vice-Presidential nominee Joseph Lieberman; a Washington Post bestseller. From Publishers Weekly: In this slender volume, the junior U.S. senator from Connecticut makes a heartfelt case that the ills of American society can be corrected by working within the current political system rather than by overhauling it. While acknowledging that the federal government is far from perfect, Lieberman contends that it has many more good people than bad and that the process succeeds more often than fails. During his two terms in office, Lieberman has staked out a position as a moderate Democrat, firmly embracing the title of "New Democrat" first articulated by Bill Clinton when he was governor of Arkansas. Through cooperation and compromise, Congress has supported the Clinton administration in passing a number of crucial pieces of legislation (e.g., the 1993 balanced budget, NAFTA and GATT trade agreements) that the senator believes have helped spur the country's record economic growth. 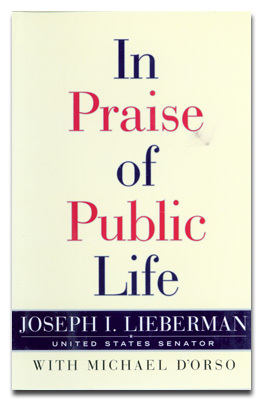 Lieberman also contends that the entertainment industry has played a major role in the decline in America's moral values; the entertainment industry doesn't reflect social norms but rather shapes values and influences behavior, Lieberman argues, and steps need to be taken to make the major media outlets act more for the public good. With so many politicians writing about burnout and their frustrations with serving in elected office, it is refreshing to hear the point of view of someone who still finds politics a noble calling.